Japanese Maples are some of the most attractive and valuable trees in any garden, so if you are lucky enough to have one on your property, you want to treat it right. When the leaves fall off and the subtle shape of a Japanese maple’s trunk is revealed during the winter months, it can be tempting to get the clippers out and get to work. These trees are among the most difficult and complicated to prune. It takes the skill and talent of a Portland tree pruning service to work with these trees and to shape, define, and encourage their inherently beautiful nature. That’s why we recommend leaving such fine tree care to professional Portland arborists. It has been said that pruning is a science and an art. Pruning is a science because it involves knowledge of plant biology and botany. It is an art because it involves understanding aesthetic beauty. An arborist or horticulturalist must understand both aspects in order to be successful with the job at hand. Japanese maples are no exception. Due to the complex nature of their branching patterns, and their position of great value in the landscape, Japanese maples require expert pruning from experienced Portland arborists. In this post we discuss why and when to prune Japanese maples. We also explore some of the nuances of aesthetic pruning that are necessary to properly care for these elegant trees. There are several reasons to prune. 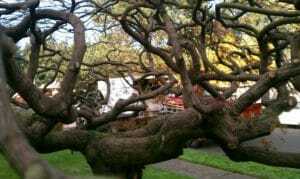 The primary reasons are related to the health of the tree, while aesthetics also play a big part. To direct growth and structure. By pruning you can direct growth habits and influence the structure of the tree as it grows. Improve airflow. Increased airflow through branches decreases the likelihood of disease. Removal of dead, diseased, or damaged branches. These should always be removed first for the health of the tree. Prevent unwanted growth. If a branch is growing into a power line, house eave, or other unwanted area, it should be removed. Reduce weight. If a branch is too heavy, trimming can reduce its weight. The best time to trim most ornamental and fruit trees is during the winter months while they are dormant. For Japanese maples, it is recommended to do structural pruning in the winter and wait until late spring, after the leaves come out, for fine pruning. Summer can also be a good time for removing larger branches and for removing dead, damaged, or diseased wood. Know the tree. Spend some time getting to know its structure. What branches need to be pruned? Which branch is the leader or apex branch? Are there competing or crossing branches? What about the overall health of the tree? What is the desired form of the tree? These questions need to be answered in order for your landscape to look its best. Trimming takes time and it will not look good half done. Rather than making a mistake that threatens the life of your Japanese maple, contact our Portland tree pruning service for ongoing expertise and support. For Japanese maples the cuts should be made on the underside of the branch to reduce the opportunity for waterspouts to form. Your arborist should work their way from the inside to the outer branches, and take good care to make proper cuts. They should be careful not to slash into the bark, or cut into the branch collar. A certified arborist will be trained on these guidelines and more. Our #1 Tip for Pruning Japanese maples: Call Us. It takes years of experience to learn how to do a good job trimming a Japanese maple. Extensive training in proper techniques is necessary. In addition to pruning skills, there are other key variables to consider, such as having the proper tools, and avoiding the spread of disease and pathogens. Finally, it takes a fair amount of time to do the job right. Call our Portland arborists today for the health of your Japanese maples.